These cookies taste heavenly, are good for you, and easy to make! Their consistency makes it hard to believe they don't contain any kind of flour. This recipe is adapted from Melissa Hemsley's Peanut Butter and Chocolate Cookies. Preheat oven to 170 degrees celsius and line a baking tray. 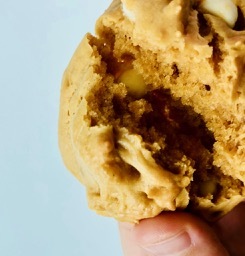 In a large mixing bowl combine 130 grams of nut butter with 3 tablespoons of maple syrup, 1 egg, 1 teaspoon of pure vanilla extract, 1 pinch of sea salt, and 1 teaspoon of baking powder. Mix until combined well. Fold 1/2 cup of quality chocolate (white, milk or dark) in to the mixture. Roll into tablespoon-sized balls, then flatten slightly with a fork.